Tenkar's Tavern: Does Anybody Do "True20" These Days? I have played a lot of True20 and it's older sibling Blue Rose. As imagined I played my games with a serious horror bend to them. I like the game better than Savage Worlds. I bought both games at the same time a few Gen Cons back and gave them both a try. Now most people like Savage Worlds, but I prefer True20. It is level based and if you have played Mutants & Masterminds at all you have an idea how it works. There are only three classes, Warrior, Adept and Expert but you can apply archetypes to them. I felt it was a very interesting take on the d20 rules and had a lot going for it. Never heard of it. Another D&D-derived game? True 20 was the second game I tried upon my return to RPGs in 2008 (the first was AD&D 2e). At the time, I was looking for something with a more "logical" rule set, without the oddities and ruffles of AD&D. True 20, like Savage Worlds, in aiming to be as setting-neutral as possible, presents a very consistent and mechanically pure set of rules. In the end, though, I found that this very consistency (only ever rolling one die, for example!) detracted from my enjoyment of gaming -- I discovered that, really, I like the odd, situational rules of older editions of D&D. 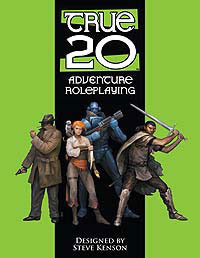 I'd say, though, that for someone who's familiar with other d20 system games, True 20 is very easy to pick up and play. I do remember there being some problems with the damage system that were debated endlessly on the old forum, and that the powers system was a little bit vague. Nope. No posts or comments removed by me. I re-checked. I somehow thought "Variable Weapon Damage by Class - Have You Used It?" was the last post. Sorry for the confusion. I've got the full run of True20 stuff. I really liked the system, as it streamlined lots of stuff I didn't like from DnD 3.x. There were two issues I had bringing it to my group. First, the biggest hiccup I had was the monetary system. It abstracted money, which gave me a hard time. I played White Wolf games with the abstracted weath system (Orpheus), and I was fine with it. I think it had to do with my familiarity with modern money. It also had a 'story' going for it, and I wanted my True20 games to be like DnD - sandboxy, dungeon delving, resource managment. "Hey, here's treasure" . . . not "here's a boon that increases your wealth by one rank." The spell ("powers") system gave my players trouble. Much like Savage Worlds, the player was supposed to come up with the visuals associated with each power. So, a wizard needed spell components, and a cleric needed prayer. But it all played the same, so it made it weird that a wizard using healing magic. Of course, I also tried to run True20 in an existing world (Iron Kingdoms), so that probably made my life more difficult. Iron Kingdoms in 3.x was already a monster, so it seemed exponentially harder on my end. My players absolutely loved when a really good roll managed to kill an ogre in one blow, or when the wizard upped the power on his spell, blew up an enemy ship, but then collapsed into unconsciousness. I've kept my books, because I like the system. But conversion causes problems, so I'd have to create a world based on the rules system if I ever ran it again. I'd run a Lovecraftian Horror or Sci-Fi game through it in a heartbeat. I really loved that system. I was a 3x junkie for a long time, and used to revise the core system endlessly to get the "feel" that I wanted. When I discovered True20, it was a real revelation. I could modify and extend on the fly with very little trouble, and the core rules were familiar to a lot of people. Unfortunately, no one else seemed to really care for the system, and Green Ronin didn't seem to do much to promote it. While, looking back, I think the system has its flaws, I still regret that more people didn't get to experience it. I think the game deserved better. I would have hoped that the system would get a reboot, but I doubt that will ever happen. As for its flaws, the system still has a lot of the finickiness that 3x players took for granted (the numerous numerical penalties and bonuses, a number of overly-complicated procedures, etc. ), the core concept--build your own class within certain broad guidelines--still has potential. I've thought occasionally about playing a "True20-style" 5e, where players just pick some skills and add special abilities and/or feats from any source. It would need some tinkering to keep it from being totally broken, but it could be cool. I vaguely remember having a copy of the core book. never played it though. My "D20 Done Right" system was Castles and Crusades. Ironic because I was a big Mutants and Masterminds fan back then. We tried it for a semester back in college. Honestly there was a lot to like about it, but the death-spirally damage model and some of the material from the splatbooks were problematic. True20 isn't rules-lite so much as rules-medium. It's definitely streamlined in comparison to 3rd Edition D&D, but it has enough blocky bits. The Toughness system for damage is actually more complicated than hit points. By modern standards I wouldn't recommend it if you're going for rules-lite gaming, as there are similar games out there which work better without the D20 baggage. I enjoyed it and ran True20 for a few games. It definitely took getting used to the toughness model for damage,and some swingy results could be awkward. It never replaced GURPS as my go-to multigenre game back then, and the BRP Gold Book killed its chances later on. I did like the interesting genre conventions it introduced, especially for fantasy, which I think were cribbed from Blue Rose.